1 လက်မျက်စိ | let-myet-si1 is a carpal bone that protrudes out at the wrist which connects to the little finger through metacarpal bone and also connects to the ulna bone at one side. အဆစ်ရောင်နေတယ် | A-hsit youn2 nay2-deare2 My joints are swollen. အသည်းကွဲပါပြီ | A-theare3 kweare3 ba2 byi2 My heart is broken! ဗိုက်ကယ်နေတယ် | Bite keare2 nay2 deare2 I have a bloated feeling. ဗိုက်နာတယ် | Bite na2 deare2 I have a stomach ache. ခြေထောက်ညောင်းတယ် | Chay2-dout nyoun3 deare2 My legs are tired! ချောင်းဆိုးနေတယ် | Choun3-hso3 nay2 deare2 I have a cough. ဒူးရောင်နေတယ် | Du3 youn2 nay2-deare2 My knees are swollen. ခေါင်းအေးအေးနဲ့ စဉ်းစါးပါ | Goun3 ay3 ay3 neare1 sin3-sa3 ba2 Think over with cool head. ခေါင်းကိုက်တယ် | Goun3 kite deare2 I have a headache. ခေါင်းမာတယ် | Goun3 ma2 deare2 He is stubborn. ခေါင်းမူးတယ် | Goun3 mu3 deare2 I feel dizzy. ခေါင်းဖြီးမယ် | Goun3 pfyi3 meare2 I will comb hair. နှာရည်ယိုနေတယ် | hna2-yay2 yo2 nay2 deare2 I have a running nose. ခါးညောင်းတယ် | Kha3 nyoun3 deare2 I have a back pain. ကိုယ်ဝန် ရှိတယ် | ko2-woon2 shi1 deare2 I am/she is pregnant. လက်ညောင်းပြီ | Let nyoun3 byi2 My hands are tired already! လက်တွဲပြီး လျှောက်ကြပါစို့ | Let tweare3 pyi3 shout ja1 ba2 zo1 Let's walk hand in hand. လက်တွဲပြီး လျှောက်ကြမယ် | Let tweare3 pyi3 shout ja1 meare2 We will hold hand and walk. မျက်နှာငယ်တယ် | Myet-hna2 ngeare2 deare2 Feeling looked down. မျက်နှာပျက်တယ် | Myet-hna2 pyet deare2 Reputation is ruined. ညောင်းတယ် | Nyoun3 deare2 I feel tired. ပါးချပေးမယ် | Pa3 cha1 pay3 meare2 I will give you a slap. ဖျားနေတယ် | Pfya3 nay2 deare2 I have a fever/ flu. လျှာရှည်လိုက်တာ | Sha2 shay2 lite da2 He is long-winded. အန်နေတယ် | Un2 nay2 deare2 I am vomiting. ဝမ်းလျှောနေတယ် | woon3 shau3 nay2 deare2 I have diarrhoea. ရင်ဘတ်နာတယ် | Yin2-but na2 deare2 I have a chest pain. ရင်နာတယ် | Yin2 na2 deare2 I feel hurt! ဆံပင်ညှပ်ချင်တယ် | Za1-bin2 hnyut chin2 deare2 I want a hair cut. Burmese word for head is ခေါင်း | goun3. Note: this word is spelled as "khoun3" but read "goun3". ခေါင်း အေးအေး နဲ့ စဉ်းစါး ပါ | goun3 ay3-ay3 neare1 sin3-sa3 ba2 -- That's the advice to think over something with cool head. Here's the break-down. အေးအေး | ay3-ay3 -- cooly. Note: when you double up the word ay3 which means "cool", the word becomes an adverb "cooly". ပါ | ba2 -- polite suggestion. ဆံပင် ညှပ် ချင်တယ် | za1-bin2 hnyut chin2 deare2 -- I want a hair cut. ပါးချ ပေးမယ် | pa3 cha1 pay3 meare2 -- I'll give you a slap. မျက်နှာပျက်တယ် | myet-hna2 pyet deare2 -- Reputation is ruined! မျက်နှာငယ်တယ် | myet-hna2 ngeare2 deare2 -- "feel small" is the feeling you have when other people look down on you, have low opinion of you, and or make disparaging remarks about you, your family or your country. The truth could be real or imagined. လျှာရှည်လိုက်တာ | sha2-shay2 lite da2 -- means the person is so long-winded. That person talks and talks and talks and talks. ပြီ | byi2 -- has reached a certain state or condition. Note: This word အသည်း is often misspelled as အသဲ. နှလုံးသား | hna1-lone3 tha3 -- heart that feels. This is a modern Burmese word which gets the idea of Heart from English. I have covered in that Burmese song not to break the hna1-lone3 tha3. ရောဂါ | yau3-ga2 means disease. Both active and passive smoking can cause အဆုတ် ရောဂါ | a-hsoat yau3-ga2 - lung disease. If your diet is high in cholesterol, trans fat and saturated fats, and if you don't exercise regularly, you may want to check whether you have နှလုံး ရောဂါ | hna1-lone3 yau3-ga2 (heart disease). Both type 1 and type 2 diabetes fall under the category of hsi3 cho2 yau3-ga2 - diabetes. ဆီးချိုရောဂါ ရှိတယ် | hsi3 cho2 yau3-ga2 shi1 deare2 -- I have diabetes. ကိုယ်ဝန် ရှိတယ် | ko2-woon2 shi1 deare2 -- (She is / I am) pregnant. Use the words နေတယ် | nay2 deare2 for short-term symptoms like flu, fever, cough, cold, vomit, running nose, swollen glands, and so on. ဖျားနေတယ် | pfya3 nay2 deare2 -- general term which means [I/he/she has/have] fever and flu-like symptoms. ချောင်းဆိုးနေတယ် | choun3-hso3 nay2 deare2 -- Use this phrase if you have a cough: I have a cough. အန်နေတယ် | un2 nay2 deare2 -- I am vomiting. အဆစ် | A-hsit is a singular form of a muscle joint. If you want to stress that several joints are swollen, you can use the plural word အဆစ်တွေ | a-hsit dway2. 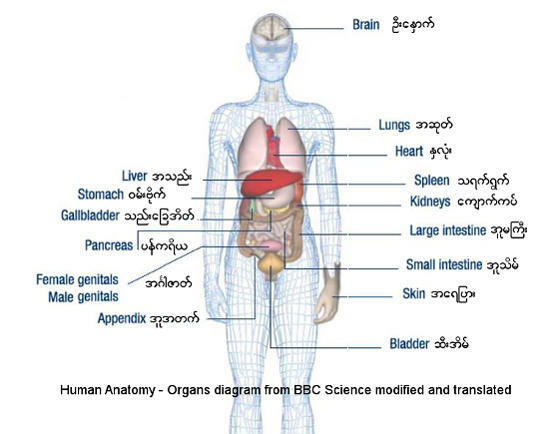 The complete word for stomach in written Burmese is ဝမ်းဗိုက် | woon3 bite. In spoken language, this word is shortened as ဗိုက် | bite. ဗိုက်နာတယ် | bite na2 deare2 -- I have a stomach ache. ဝမ်းလျှောနေတယ် | woon3-shau3 nay2 deare2 -- I have a diarrhoea. ဗိုက်ကယ်နေတယ် | bite-keare2 nay2 deare2 -- Use this phrase if you have a bloated feeling in the stomach due to indigestion. ကြ | ja1 -- plural to imply "we"
လက်တွဲပြီး လျှောက်ကြမယ် | let tweare3 pyi3 shout ja1 meare2 -- We will hold hands and walk. 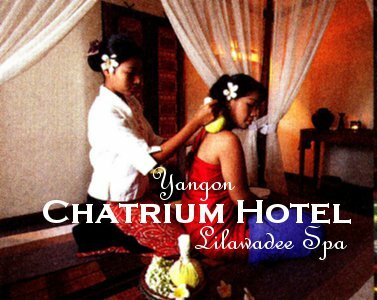 ခါးညောင်းတယ် | kha3 nyoun3 deare2 -- I have a back pain. It's interesting that kha3 refers to the waist, but that phrase can be used for the muscle sore from the waist up instead of the word for the "back", which is kjau3. ခြေထောက်ညောင်းတယ် | chay2-dout nyoun3 deare2 -- My legs are tired! ပြီ | byi2 -- has reached certain state or condition.